Each Call of Duty comes with a wide array of weapons, gadgets, and perks. Choosing the right ones can make all the difference, so let’s see what the pros use. Professional players in Call of Duty generally play under a different, more finely tuned ruleset than public players. With this said, the majority of professional class setups work perfectly well in public multiplayer. This is especially true of Black Ops 4 due to the ruleset being very close to public matches in terms of class setups. We will focus down on the main classes used by the majority of pro players as well as a few details on why the classes are so useful. 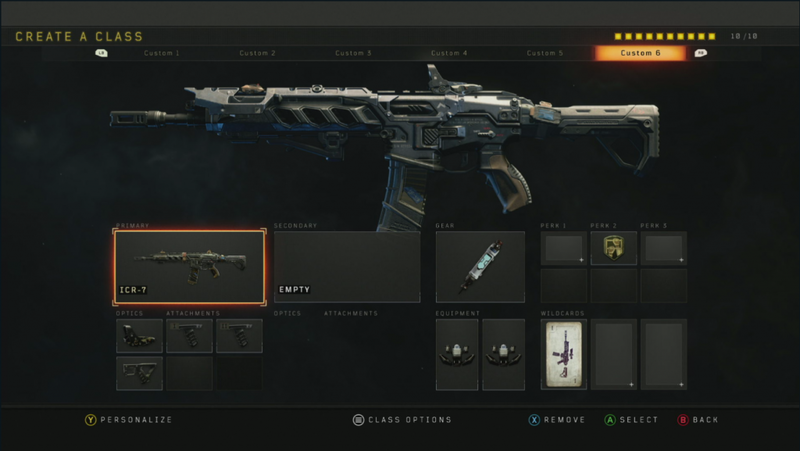 The four class setups we will look over today are: Respawn Maddox, SnD Slayer Maddox, Trophy System ICR, and Quick Peek Saug 9mm. The class focuses primarily on the efficiency of the Maddox’s kill rates. The double Quickdraws allow for nearly SMG levels of ADS speed and the stock allow for quick strafing. Due to Black Ops 4’s ADS mechanic retaining hipfire speeds for a split-second after you ADS, competitive players use Stock along with Left-Trigger spam to move at hipfire speeds while ADS’ing. This makes you a hard target to hit and allows you to cover more areas safely. The class uses Tactical Mask to mitigate the effect of Concussion grenades and equips Dexterity for quick slide cancels. The third perk is left empty in favor of a Concussion grenade of your own. The best of both worlds. Lastly, the mandatory Stim Shot is thrown on as its effect benefits outweigh all other gear options. 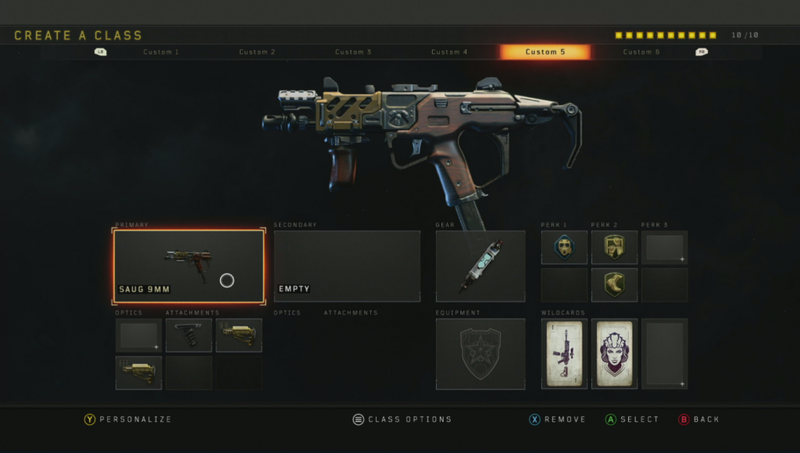 This popular Saug 9mm class prioritizes speed over all other factors. The class will let you get to your objective quicker and stay alive longer. It does this in several important ways. Let’s start with the double Stock. The stocks allow for very fast strafing speeds while ADS’d. This allows players using the class to safely “quick-peek” or “shoulder” around corners for less than a split-second. This tactic can give you and your team vital intel on enemy postions around the corner without putting yourself in much danger. 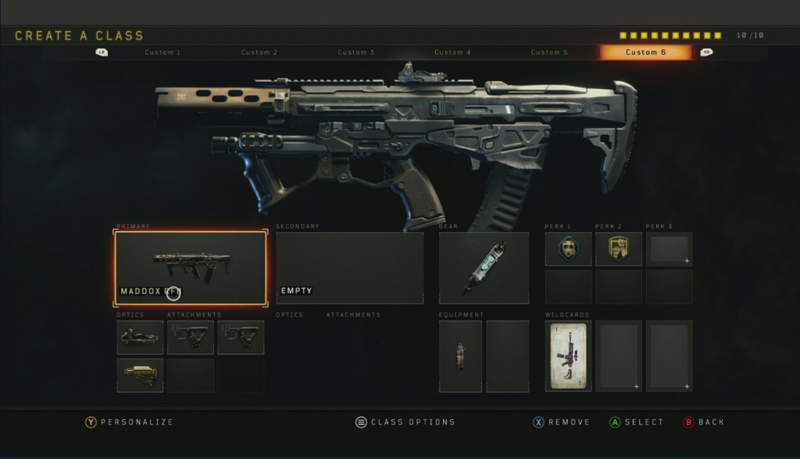 Due to the high time-to-kill in Black Ops 4, most players will be unable to kill you before you duck back into cover. To double down on this strength, the class also features Lightweight. The perk will allow you to get to the objectives faster than the enemy, allowing you to get ready to quick-peek around the corners closest to their entry-point into the objective. Additionally, Tactical Mask prevents serious harm from crowd control and the Grip stamps down on the kick of the 9mm. Dexterity rounds out the class to allow for quick slide cancels. As this class is mostly the same as the first Maddox, we will skip over the similarities and focus on the difference. In Search and Destroy, the gameplay moves slower and the map is naturally quieter due to more cautious gameplay. This means most players with a headset will be listening for those telltale footsteps to pinpoint your location. The Concussion from the first class is thrown away in lieu of Dead Silence. This is the most important perk in Search and Destroy. 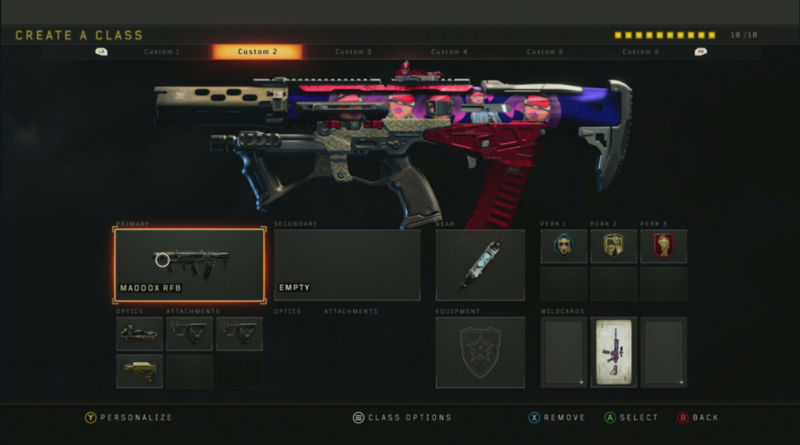 If you ever find yourself playing SnD, make sure you equip it. It eliminates most sound made by footsteps. It is a staple perk used by nearly every professional player in SnD. Alright, let’s get started on the oddest class in the list. The ICR-7 is a long range rifle with limited speed due to no Stock option. So what do the pros do in respawn game modes to ensure they bring the most to the table while using this weapon? They add utility often times through the usage of Trophy Systems. This class rocks two of the anti-projectile boxes and foregoes both perk 1 and perk 3. The class provides quick cover from incoming Concussions, 9-Bangs, Cluster Grenades, and more without the need for Tactical Mask or Flak Jacket. Better yet, the systems protect a wide area of effect which means teammates benefit from the effect as well. Dexterity is kept on to allow for the quick slides and mantles. Quickdraw along with Primary Gunfighter 1 ensures that if the player is forced into a fight during rotations, they can fight without too much trouble. Some competitive players may only take one Trophy System in order to allow for a perk 1 Flak Jacket, but these are interchangeable and dependent on the current course of the game. These classes will help get you more wins in gunfights than ever before. 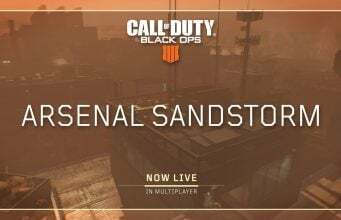 Each is regularly used by professional players in high level matches and will work even better against the average player in Black Ops 4.